As a corporation, Hyundai is not new to the electric-vehicle market: the fast-growing South Korean automaker began selling its first all-electric car under its Kia brand in 2015 with the Soul EV. 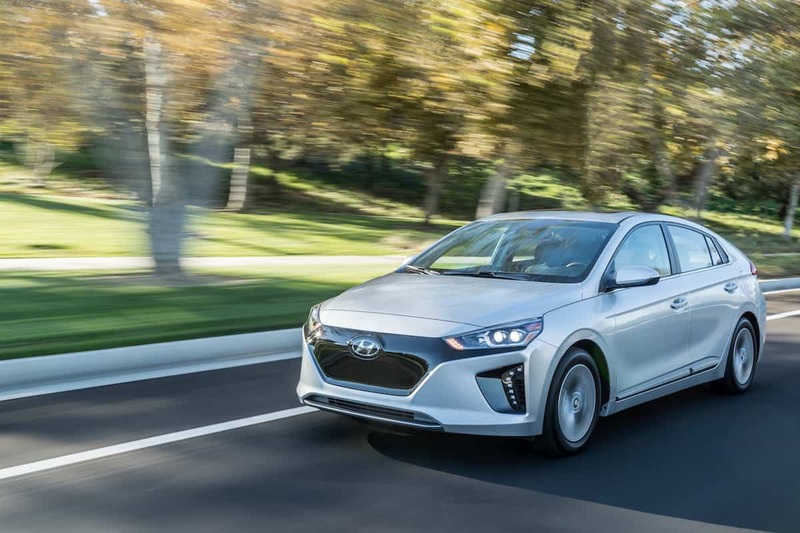 Two years later, Hyundai was ready to stick its own name on an EV, and it comes in the form of the Ioniq, a compact hatchback that was developed from the ground up with electric propulsion at its core. In addition to the electric model we tested, there’s a hybrid model that runs on a mix of gas and electricity, and the company has promised a plug-in version for the future. But no matter, because we’d argue this all-electric variant is the most relevant in a marketplace that is quickly adopting electricity as the fuel of the future. The Ioniq’s styling is more conventional than many electric vehicles, something that will appeal to drivers put off by the space-agey looks of the Nissan Leaf and BMW i3. The Ioniq is about the same size as the Elantra sedan, with comparable interior space and good build quality. But one of the first things we noticed is that the doors feel very light and make a cheap-sounding noise when they close. It’s an obvious move to cut weight to offset the heavy battery pack that lets Hyundai promise 200 km of driving range. On the plus side, our test car had rose-gold interior trim that helped dress up what is otherwise a pretty plain cabin that prioritizes functionality over form. That was a nice touch, given a US$29,500 / C$35,649 starting price for the car’s entry-level SE trim. Our tester added a cold-climate package of heated rear seats and battery temperature management system for an extra C$1,200. Interior space is good for four adults, despite a sloping roof that looks ready to shortchange those riding in the back. Rearward visibility is disappointing, thanks to the split rear window and blind spots created by the C-pillars. 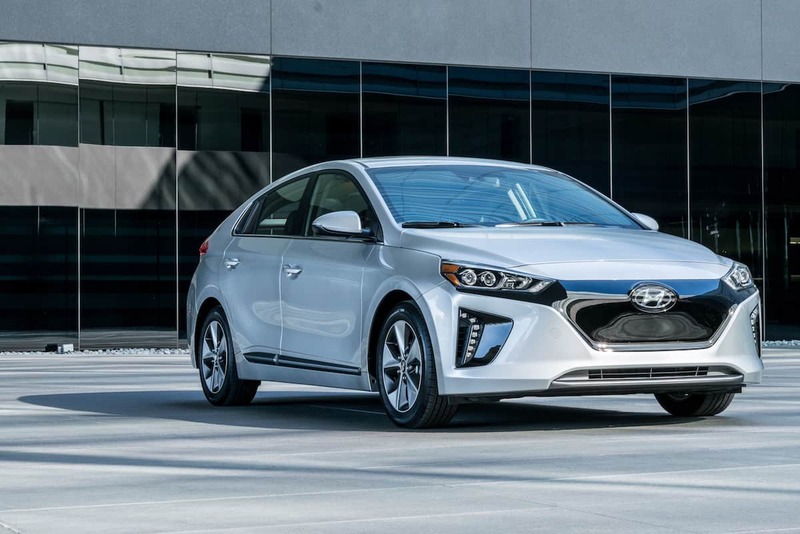 The Ioniq’s appearance and accommodations may not be much to rave about, but like all electric cars, the drive stands out for its lack of noise and vibration owing to the absence of a combustion engine. The only notable noises come from the tires and the wind rushing past as the car gains speed. The Ioniq’s styling is more conventional than many electric vehicles, something that will appeal to drivers put off by the space-agey looks of the Nissan Leaf and BMW i3. Speaking of speed, the Ioniq has enough of it to keep up with city traffic, due to the generous torque that electric motors are known for, but this is no Tesla Model S. Performance feels about the same as that of a subcompact car with approximately 100 horsepower, but that’s actually tough to gauge by the seat of the pants because of the lack of drivetrain noise we’d normally use as a reference point. More notable was its nimble cornering feel, aided by the weight of the battery pack under the floor and in front of the rear wheels. Hyundai engineered the Ioniq for one-pedal driving capability, so that you rarely have to use the brake pedal. Instead, the car will use its regenerative braking system to slow the car when you lift off the accelerator. It’s a novel way to drive that takes some getting used to, but it encourages the use of the braking system to help convert that energy into electricity that gets fed back into the battery. Presumably, it also prolongs the life of the friction brakes, so a set of pads and rotors will last longer than they would in a conventional car, and require less frequent replacement. There’s a lot to like about Hyundai’s first electric car, but it’s not without shortcomings. Nissan recently announced it will begin selling its second-generation Leaf in early 2018 with a promised 240 km of driving range and a C$36,000 starting price, and while the Chevrolet Bolt starts at more than C$43,000, it’s good for as much as 380 km on a fully-charged battery. Both of those facts put the Ioniq at the back of the pack for EVs priced for mainstream consumption, an unenviable position for a brand-new model. But Hyundai loyalists — and there are many, now — can finally buy an electric car with their favourite automaker’s name on it. 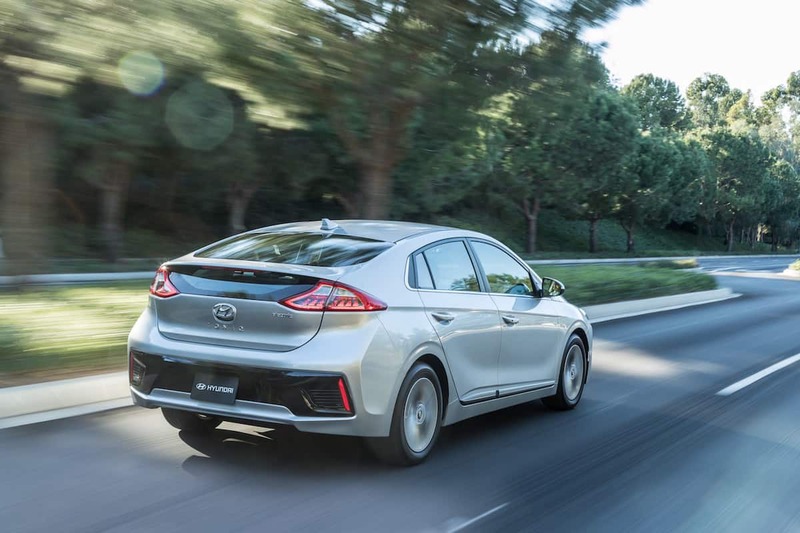 Between that and this company’s proven ability to make rapid improvements in its vehicles’ performance, quality and refinement, don’t expect the Ioniq to bring up the rear for long.